Now that summer is over (sad, we know), we seem to get a majority of our blonde clientele that wants to go darker for winter. Sometimes those beautiful light blondes can give you a washed-out appearance once you’ve lost your summer tan. Just like going from dark to blonde is a process, the same is to be said when going from blonde to a darker color, that being brown in this instance. The age-old myth is that you can pick whatever color (you as the client) wants from a color swatch book and your stylist can just throw that color on your hair- one and done, easy-peasy out the door. This is incorrect and we here at Grace Kelly Salon are going to explain in-depth as to why going from blonde to dark is just as much of a process as it is going from dark to blonde. As we lighten dark hair there is always an undertone, or underlying pigment to each level of hair color. For example, light brown hair has a red undertone. What does this mean to you, and why do you care? Well this is why when your hair gets lightened it can look red or even have a orange tint. Your stylist takes this into consideration as your hair is going through this process. When the desired level of lift is achieved, the underlying pigment is then toned out with the corrective tone. This is how we combat brass, or yellow in blondes, and this is how we give you, the client those gorgeous light blondes you’re always after. With that being said, when one wants to go dark after being blonde it should be noted that all of those underlying pigments that are present in each level of hair color is gone. If you would just throw say a dark brown onto that light blonde your resulting color would end up looking very flat and more than likely have a greenish tint to it. On top of your color not being what you had planned for, it wont stay and in most cases will look very splotchy. Taking out those undertones/underlying pigments leaves nothing for the new hair color to grab ahold to and stay. In order to make sure your color is vibrant, shiny, and stays for you without any greenish tints to it your stylist will “fill” your hair first. Filing the hair is done by using our shades EQ gloss which is ammonia free and has a high shine finish to it. Depending on how dark you want to go will depend on how many times your stylist decides to fill your hair. Filling your hair is when your stylist goes through and adds the appropriate underlying tone/pigment that your hair is missing at each appropriate color. Those missing pigment colors is what was taken out in order for you to become that light blonde. During this process, each time the hair is filled it is then rinsed and dried before the next “fill” color is applied. You get to see first-hand the tones your hair goes through in order to be dark again. But don’t worry, this is only a temporary look you have to see. These undertones are what gives your hair those beautiful rich brown colors that are full of life. They are needed in order for your hair to go from blonde to brown correctly. Once your hair is filled appropriately, your color can finally be applied and processed for the appropriate time. 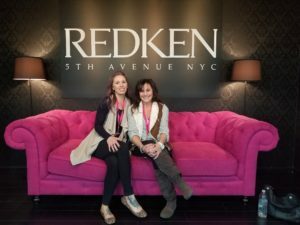 We recommend finishing with a color extending treatment along with the appropriate take home products of Redken Color Magnetics shampoo and conditioner.